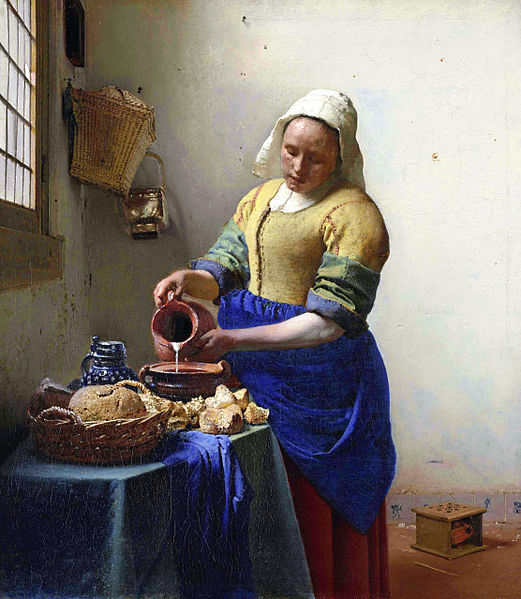 A favorite technique of old Masters was the technique of under painting in which a layer of paint is applied on the surface for painting to prepare it for the application of other colors. This layer is very important because it affects the optical quality of other colors, and other paint layers going to be laid over it. 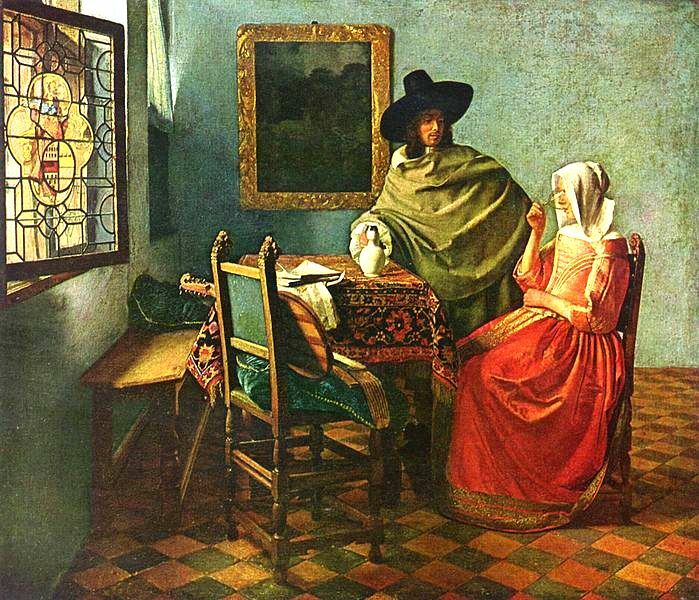 Johannes Vermeer (1632-1675) acknowledged as one of the greatest painter of the world knew the significance of under painting. 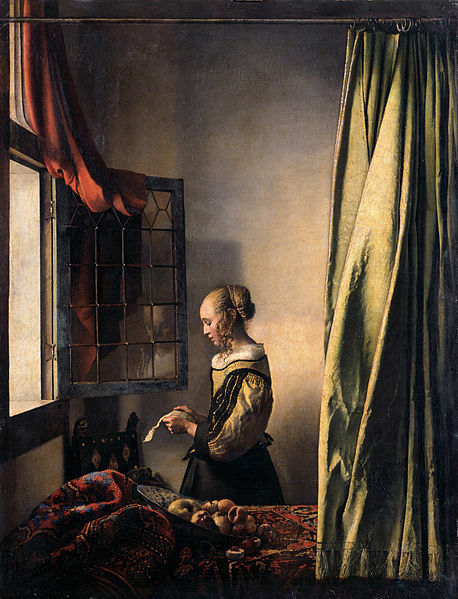 It is in itself a wonder, how Vermeer with a limited range of colors available, at that time and with a limited range of subject matter, primarily domestic interior scenes, was able to create paintings of exquisite beauty and artistic caliber. 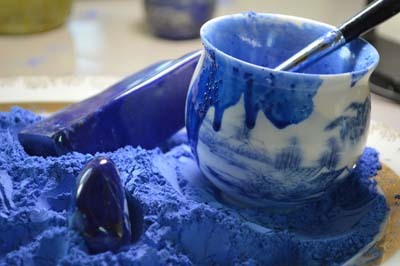 We can no doubt attribute this to his great skill and moreover to the extensive use of genuine lapis lazuli pigment or natural ultramarine in his work. For under painting or as an undercoat. 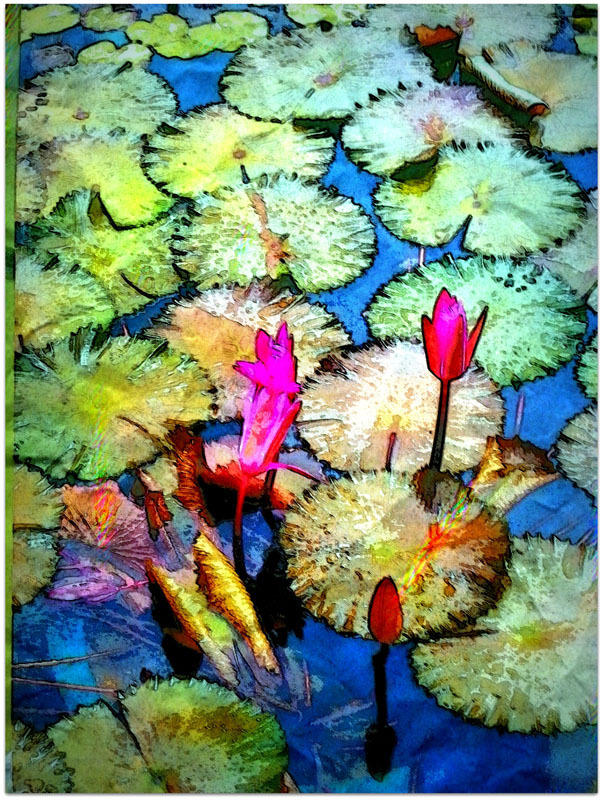 in Layers to accentuate and alter the tone of other colors. in glazes on the top to give an overall shimmer to his paintings. 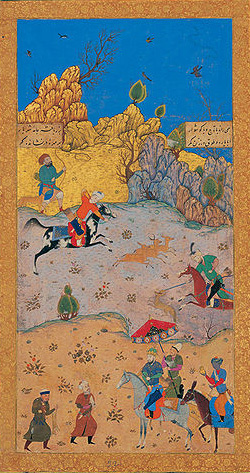 The artist had an exceptional knowledge of the optical phenomena of adding a gemstone pigment to his art. 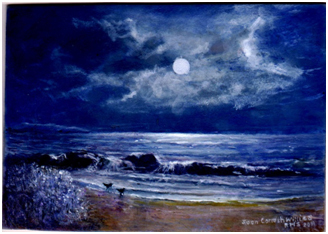 He knew how ultramarine paint layer when applied on his canvas would interact with other paint layers applied on it or under it. 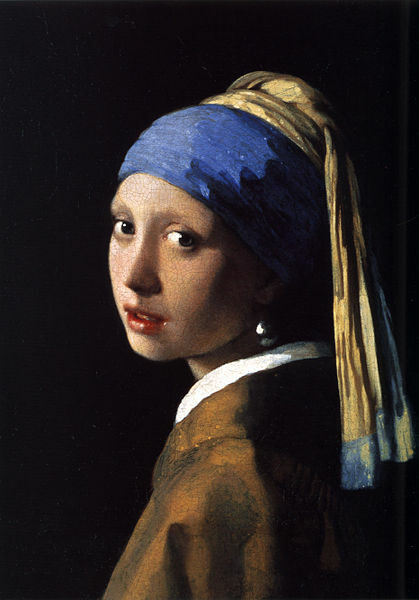 He knew that genuine lapis pigment would give chromatic brilliance to other paint layers and this would in turn enhance the painting’s visual quality and its surface tone and radiance, so he used ultramarine pigment mixed with linseed oil and nothing else as a first undercoat on his paintings. This helped him to achieve highly sensuous light effects. 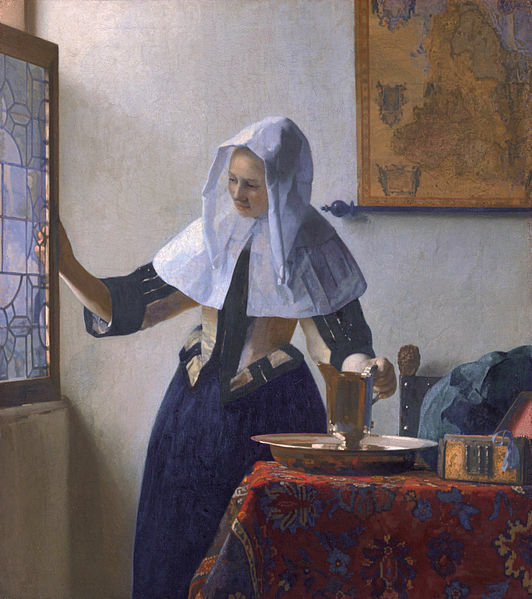 Lapis is the most stable and most brilliant of all pigments, Vermeer was lucky; he got the best lapis pigment that came from Afghanistan- from his rich patron. His use of lapis for under painting can be seen in many of his works. for instance in the two paintings “the wine glass” and “the girl with the wine glass” of almost the same setting, the shadows of the red satin dress are under painted in natural ultramarine and then a combination of vermillion and red lake is applied on it. A slightly purple tinge is achieved thus which gives a crisp firm feel to the rich satin gown. The yellowish green wrap of the man in “the wine glass” is under painted with ultramarine and then painted with yellow ochre. 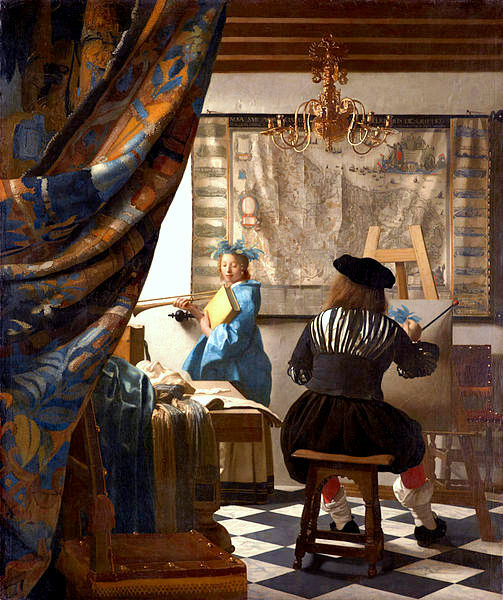 Vermeer had a limited palette in the 17th century, he extended his palette in a very ingenious way , he mixed ultramarine directly with other colors also he applied ultramarine layers on dry layer of other colors ,thus the layers got optically mixed to give new range of colors. 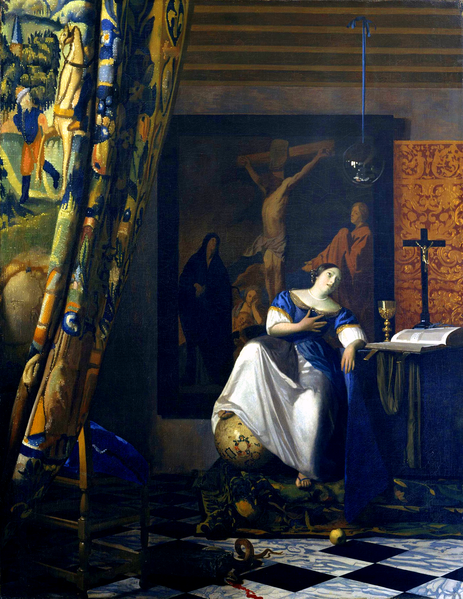 In all of these paintings, we see that natural ultramarine is used not only separately but also in layers and combined with different colors. The linen headdress of the “woman with water pitcher” is painted with lead white and a hint of grey, later touched with ultramarine to give it a crisp, fresh translucent look of starched cloth. The laurel wreath worn by the girl in “ allegory of painting” is glazed with ultramarine and then glazed with yellow lake. Besides using it for underpainting and for layering , he took great pleasure in using it in clothes and for decorating heavy tapestries and other objects also since he knew that with the vivid bright blue of lapis his painting would throb with living energy. “The milk maid” and “ The girl with the pearl earring” where he applied lapis glazes to give a jewel like glitter to his paintings. 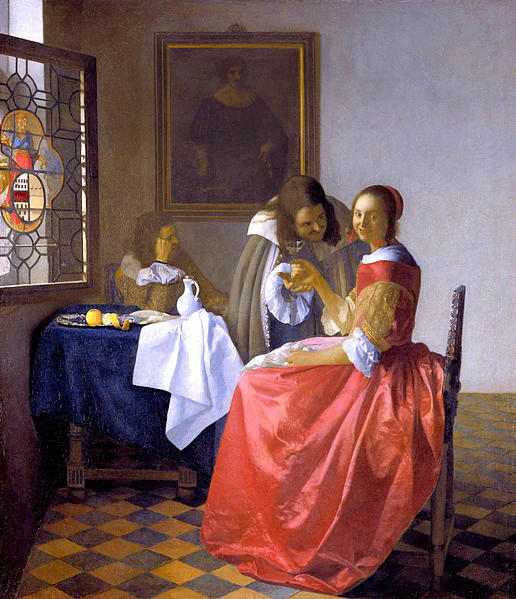 Vermeer ‘s paintings are actually a document that yet again established the superiority of Lapis pigment over other pigments especially synthetic ones. He showed through his paintings what marvels lapis pigment can do for artists and how its single layer can transform a painting into a masterpiece. 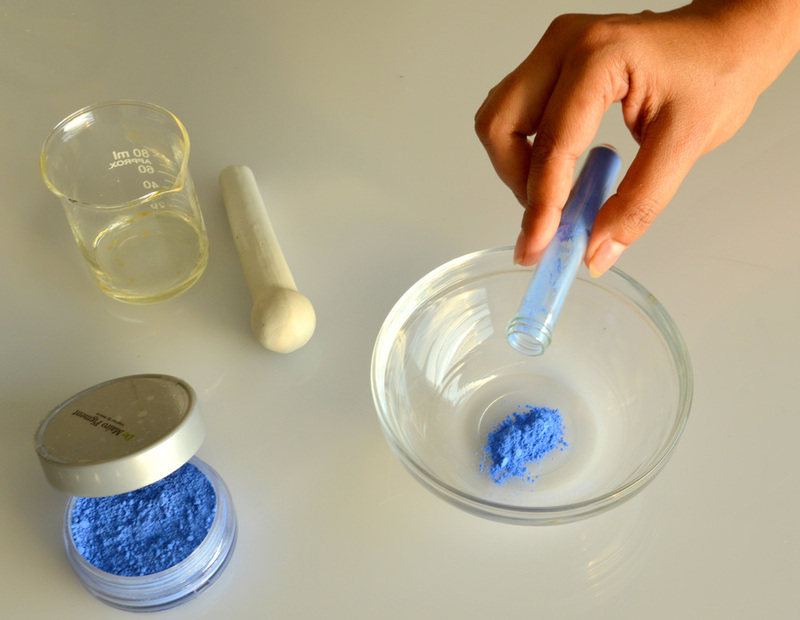 Natural Lapis lazuli is available , you can go to http://www.demairo.com website , actually gemstone pigments have crystaline structure, because of that they have more ,luminosity and brilliance.